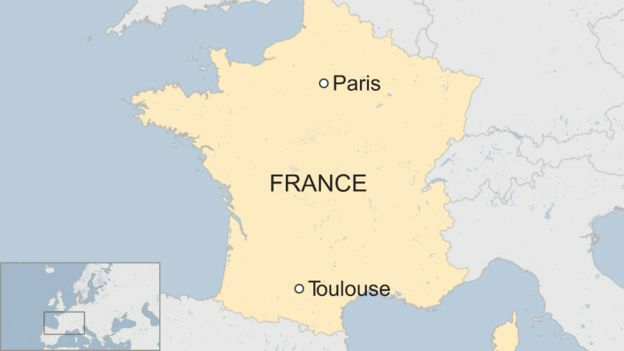 A driver has ploughed into a group of pedestrians near the French city of Toulouse, injuring three Chinese exchange students. A 23-year-old woman was seriously injured, and two men aged 22 and 23 were also hurt, police said. The 28-year-old driver "purposefully hit" the group on a crosswalk, Toulouse prosecutor Pierre-Yves Couilleau said. The victims are students at the ICD-Toulouse International Business School. The woman's life is not in danger, police said. The driver was arrested immediately afterwards. Police said he had several previous minor convictions, some drugs-related. Unconfirmed reports say he had a history of mental illness including acute schizophrenia. La Dépêche du Midi newspaper quoted him as telling police he had heard voices telling him to harm someone. Mr Couilleau visited the scene of the accident and said there was no suggestion the incident was an act of terrorism. The man "had been planning this act for a month", Mr Couilleau added.